This object lesson teaches that it isn’t enough to be Christians in this world. We need to have “saltiness” so that we help to make life better, heal those who are hurting and save those who are lost. 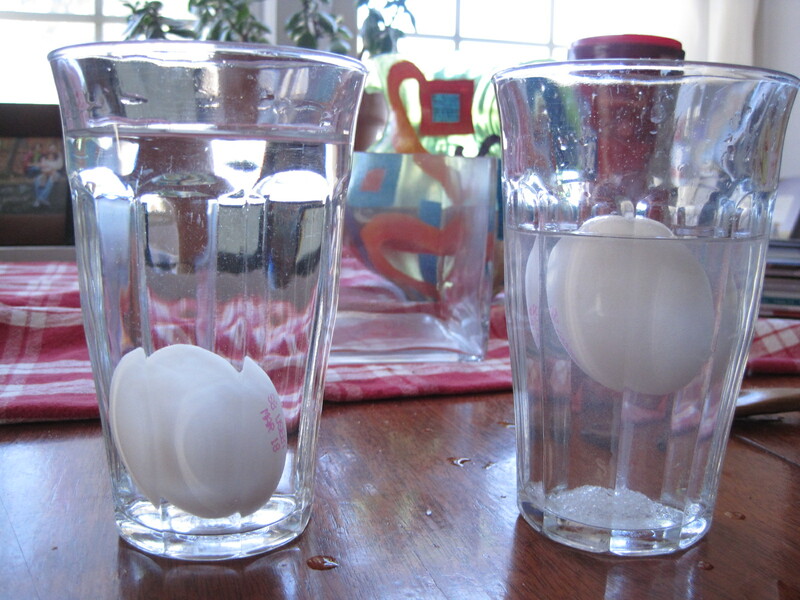 It uses a science experiment in which you can make an egg float by adding salt to water. Set out your materials on a table at the front of the room. Find the Bible passage, and highlight it or put a bookmark in that spot so that it will be easy to find later. For dramatic effect, you can also add vegetable oil. It won’t mix with the water, and it gives the egg the look of being suspended between the two levels (heaven and earth). You can point out that when we accept Christ into our lives, we are anointed (set apart for God’s purposes). In Biblical times, anointings were done with oil. I am going to use this object lesson with my Bible class next week. Thanks for the great idea! Love this lesson and I will use it for children’s message one Sunday. One thing…I saw near the end (after adding the salt) that it says to place the egg back in the water. I missed seeing where the egg is taken out. Can you please clarify? Thanks for the idea! Good catch! I forgot to mention that. I’ve updated the lesson to include this step (right before the volunteer adds salt to the water). Thank you for helping me improve the lesson. I hope it’s a blessing to your ministry! Thanks so much! Can’t wait to try it out. I love it, such a great one!